The 2004 Mustang GT came in two options packages: the Deluxe and the Premium. Both packages standard items include: 4.6 liter V8 engine; dual exhaust; fog lamps under the bumper; side scoops; rear spoiler; 17 inch wheels, and power adjusted 6-way drivers seat. The GT Deluxe package comes with the standard stereo and cloth seats while the GT Premium package comes with the leather seats and the Mach 460 audio system. Redfire 2004 Mustang GT convertible owned by Dan and Debby Heagy from Aberdeen, Maryland. Dan tells us more about his GT, "We searched on cars.com and found it at a Chevrolet Dealer in New Jersey. We watched it for about a month to see if the price would come down and it did. Out of 1500 Mustangs on the website we liked this one the most because of the low miles of 23,000 miles. We bought it last August on the 4th, its an 2004, I have Mustang club number 0004, and the last 6 digits are 221111 which add up to 4. It replaced a 98 GT Mustang that was totaled two and a half years ago. I'm currently the Vice President of the Mustang Club of Maryland. We attended the 45th Mustang Anniversary in Alabama and are looking for the 50th. I love driving with the top down on warm sunny days. I installed the Ford Racing suspension kit, BBK throttle body, MM strut tower brace, Mac prochamber exhaust, SSP loudmouth mufflers, and Ford Racing 373 gears." Sonic Blue 2004 Mustang GT owned by Brian Manders from Grand Prairie, Texas. Brian tells us, "I bought this 2004 Mustang GT in Ft. Campbell, Kentucky in 2006 when I got back from my first tour in Iraq. It was two years old and had 15k miles on it. It came with K&N air intake, short throw shifter, and Steeda tips. I put in a BBK 75mm throttle body, BBK shorty headers, Bassani O/R X-pipes, Diablo sport tuner, and Eibach pro kit springs. In the front I put Bullitt rims 17x9 black finish. In the rear is Bullitt black finish 17x10.5 sitting on Nitto 555 extreme ZRs. The headlights are dark smoked. I have been in a few car shows - two first place awards and two top-10 class awards." Competition Orange 2004 Mustang GT convertible owned by Mike and Shirley Roode from Maitland Ontario Canada. This was our featured Attitude Of The Week for the week starting March 28th, 2010. Mike adds, "We purchased it new in July of 2004. Essentially no mods other than light bar, chin spoiler, and under hood chrome kit. This car is 1 of only 408 GT convertibles in this color; 177 automatics and 231 5-speeds." Check out our special Orange Mustang page where you can check out other Mustangs that Ford offered in orange. 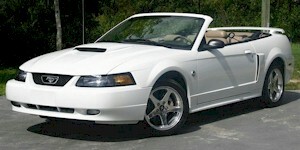 Oxford White 2004 Mustang GT convertible owned by Josh Haralson from Forest, Mississippi. He just received the car two weeks ago for graduation. Josh says is stock (4.6L automatic) except for an X-pipe and 40 Series Flowmaster mufflers! Tim Davis owns this Black 2004 Mustang GT coupe. It has a 4.6L V8 and an automatic transmission. Tim shares, "I have always loved Mustangs all my life. When I finally came into the market of getting one, I search for 6 months to find the right one. I have always loved black Mustangs, so I waited for the right one to come along. I have always thought - among all of the many styles and models the 99-04 models looked good. I liked the body style. I finally ran accross the one I wanted and it was in pristine condition. I latched unto it and today it stays in the garage when I'm not out sporting it around and believe me it turns heads. I love my Mustang. My dream is to one own a classic 65-67 Shelby GT fastback." Redfire 2004 Mustang GT convertible owned by a site visitor. Check out the rocker stripes and dual stripes on the front fender. Screaming Yellow 2004 Mustang GT coupe owned by Brandon Compton from Pikeville, Kentucky. It has stripes over the top and rockers. Screaming Yellow shade was first used on the 2004 Mustang and carried through 2006. Prior to 2004 a lighter yellow called Zinc Yellow was used.